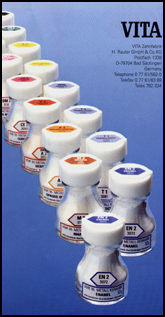 shades, its excellent handling properties and the ability to bond reliably to various types of alloys. The "glowing", lucid shades create restorations with the desired natural appearance. 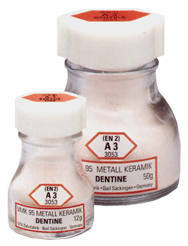 Vita VMK 95 porcelains are specifically designed for increased performance and rational handling The standard build-up technique achieves good results using only opaque, dentine and enamel. Special effect powders are available for refining the restoration and can also be used very effectively with minimum effort. The assortment is compact, clearly laid out and only contains the essentials. It offers reliable shade reproduction and "glowing" shades. The Vita VMK 95 Metal-Ceramics System is compatible with silver. 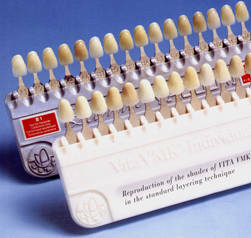 Note: Vita VMK products are only available to qualified dental practitioners.